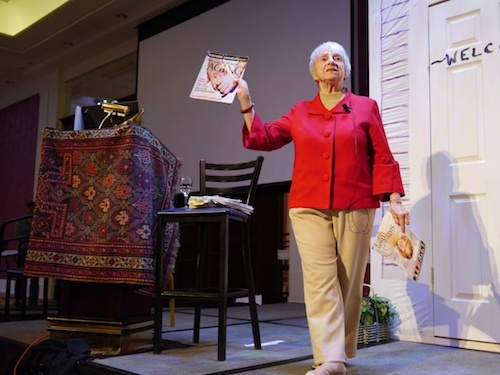 Being older is the best time of your life, said Connie Goldman, former NPR reporter, pro-aging advocate and the featured opening speaker at the 6th Eden Alternative International Conference in Grand Rapids, Mich. May 31. Over twenty-five years ago at the age of 50, Goldman felt called to go out on her own to explore the positive aspects of aging in a culture that seems to be obsessed with “staying young”. Her explorations led to conversations with many famous public figures on a variety of issues related to aging, as well as collecting interviews with hundreds of what she’s labeled, “extra-ordinary older persons”. Ageism pervades our culture and influences all our interactions, Goldman said. Why do people always say “you look so much younger than you are” as a compliment? Why do young people always call older women “dearie” and other patronizing terms? “It’s my job to teach young people not to patronize older people, and to teach older people not to accept it,” Goldman said. Goldman first met Bill and Jude Thomas working on her book The Gifts of Caregiving: Stories of Hardship, Hope, and Healing, which was published in 2002. The book brings the Thomases together with other big names, such as Studs Terkel and Rosalyn Carter, to highlight very personal reflections on the giving and receiving of care. Both poignant and powerful, Goldman’s book reminds us that sharing the gift of care is indeed an invitation for us to grow. Other titles by Ms. Goldman include Secrets of Becoming a Late Bloomer: The Art of Staying Creative, Involved, and Aware in Mid-life and Beyond; The Ageless Spirit: Reflections on Living Life to the Fullest in Mid-life and the Years Beyond; Late Life Love; and Who Am I … Now That I’m Not Who I Was? To learn more about Connie Goldman, check out her web site at www.congoldman.org. What i do not understood is actually how you are not really much more well-liked than you may be now. You are very intelligent. You realize thus significantly relating to this subject, made me personally consider it from a lot of varied angles. Its like men and women aren’t fascinated unless it’s one thing to accomplish with Lady gaga! Your own stuffs nice. Always maintain it up!